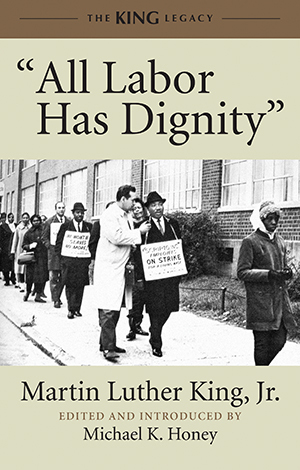 Beacon Press: "All Labor Has Dignity"
Covering all the civil rights movement highlights—Montgomery, Albany, Birmingham, Selma, Chicago, and Memphis—award-winning historian Michael K. Honey introduces and traces King’s dream of economic equality. Gathered in one volume for the first time, the majority of these speeches will be new to most readers. The collection begins with King’s lectures to unions in the 1960s and includes his addresses during his Poor People’s Campaign, culminating with his momentous “Mountaintop” speech, delivered in support of striking black sanitation workers in Memphis. Unprecedented and timely, “All Labor Has Dignity” will more fully restore our understanding of King’s lasting vision of economic justice, bringing his demand for equality right into the present. “All Labor Has Dignity is an illuminating argument that King was concerned with much, much more than just the plight of black people. His public career may have started in that arena, but it ended with him as a champion for progressives around the globe. I want to use as a subject “The Domestic Impact of the War in America.” This question is historic because it is an authentic expression of the conscience of the labor movement. As has been said already this afternoon, tens of millions of Americans oppose the war in Vietnam. Never in our history has there been such a passionate, popular resistance to a current war. In addition to the millions upon millions of ordinary people, eminent scholars, distinguished senators, journalists, businessmen, professionals, students, and political leaders at all levels have protested the war and offered alternatives with an amazing tenacity and boldness. But one voice was missing--the loud, clear voice of labor. The absence of that one voice was all the more tragic because it may be the decisive one for tipping the balance toward peace. Labor has been missing. For too long the moral appeal has been flickering, not shining as it did in its dynamic days of growth. This conference, a united expression of varied branches of labor, reaffirms that the trade union movement is part of forward-looking America. (Applause) That no matter what the formal resolutions of higher bodies may be, the troubled conscience of the working people cannot be stilled. This conference speaks for millions. You here today will long be remembered as those who had the courage to speak out and the wisdom to be right. It is noteworthy that the Labor Party of Great Britain, which, of course, has no responsibility for our actions, nonetheless went on record on October 4 in a formal national resolution calling upon its Labor government to dissociate itself completely from U.S. policy in Vietnam. (Applause) It urged its government to persuade the United States to end the bombing of North Vietnam immediately, permanently, and unconditionally. Listen to interview with Honey on KPFK's “Sojourner Truth"